It’s very easy to hit the search engine and diagnose your dental problems online, but are you sure that you’re making a wise move by doing this? It’s simpler to consult the Internet when you’re having oral problems than to book appointments and drive to your dentist’s office, but it’s also too easy for you to misdiagnose yourself, make the wrong decision and jeopardize your entire health. 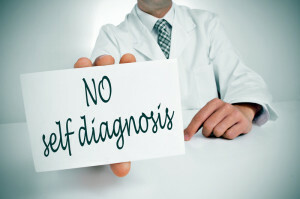 Self-diagnosis based on information on the Internet can be hazardous to your health. Laymen don’t have the appropriate education and training to make a proper diagnosis that dentists have. There are also certain nuances in diagnosing oral problems that only dentists and other dental professionals know and understand. Plus, a certain symptom like toothache may be shared by a number of dental problems like tooth decay, tooth fracture, abscessed tooth, damaged filling, bruxism or gum diseases. Only dentists can know what exactly is the oral problem that you’re experiencing after performing a thorough examination. So what you may self-diagnose as a mere toothache could already be something far more serious. The nature of the web is haphazard, and the information given may differ from one website to another. Relying on forums is even worse as the people who post their comments or testimonials may be giving the wrong information to you. Even though the article or blog post looks legitimate, it is not enough because there’s a risk of you downgrading or exaggerating the symptoms you’re experiencing because of certain biases on your part. Self-diagnosing through information on the Internet fuels Cyberchondria. According to Cyberchondria: Studies of the Escalation of Medical Concerns in Web search by Ryen White and Eric Horvitz, Cyberchondria “is the unfounded escalation of concerns about common symptomology based on review of search results and literature online.” The London Sunday Times defined it as “the deluded belief you suffer from all the diseases featured in the Internet,” while BBC news referred to it as an “Internet print out syndrome”. When you have Cyberchondria, you unnecessarily worry about some symptoms that are usually just signs of relatively common illnesses. You would become more fearful, more worried and would be far from being assured after you’ve hit the search engine in the first place. To avoid worrying incessantly and to be absolutely sure about what you’re experiencing, it’s always best to visit your doctor or dentist for an accurate diagnosis and treatment. Because there’s a high risk that you’ll misdiagnose yourself and buy inappropriate drugs or use home remedies for treatment without knowing all the facts, it is highly advisable to seek professional help rather than use Dr. Google. The Internet should not be your first option for seeking medical help; rather, it must only be used for gathering more information about your dental condition after it has already been properly diagnosed by your dentist. If you’re experiencing any symptoms indicating an oral health problem, visit Dr. Trinh Nguyen, MD at CDIC for a proper oral examination. Here at CDIC, we have the best dental care professionals and the latest technology in dentistry available to give you the right diagnosis and treatment. You can talk to our dentists or visit our website to know more about the services and treatments that we offer. Call us today at (714) 702-1328, (714) 793-9480 or (714) 804-0592 to book your appointment! This entry was posted in Self-Diagnose and tagged Cyberchondria, objective diagnosis, oral health on June 9, 2015 by Francis Nguyen.